Since its inception in 1999, DocAviv has become one of the leading cultural events in Israel with the aim of promoting Israeli and international documentary film. ITVS’s Claire Aguilar attended the 2012 DocAviv International Film Festival May 3-12, as a juror for Israeli Competition. Over the last 10 years, Israel has become one of the leading sources of independently-produced documentary films. There is a dizzying abundance of documentary films and filmmakers in Israel — and not only are there many, they have also been successful: showcased in international festivals, sold to broadcasters in Israel and in the U.S. and Europe, winning prizes and garnering international press. It has been amazing to witness the growth of strong, innovative, and diverse Israeli films — covering subjects that you would expect to see from Israeli filmmakers, such as the Arab-Israeli conflict — but also covering the personal and global experience, films about family, identity, and culture, with other films covering globalization, immigration, and homophobia. I heard from one filmmaker that there are at least 20 film schools in Israel, and that is mostly counting only Tel Aviv and Jerusalem. The community of documentary filmmakers is intimate, diverse, and full of talent — and here at ITVS, we have been fortunate to work with many Israeli filmmakers over the past eight years and have showcased them on U.S. public television: Ari Folman’s Waltz with Bashir, Dalit Kimor’s Pickles, Inc., Yoav Shamir’s Flipping Out, Ran Tal’s The Children of the Sun, Nati Baratz’s Unmistaken Child, Ruthie Shatz, and Adi Baratz’s The Collaborator and His Family, and many others. So it was a great honor for me to be invited to this year’s DocAviv as a juror for Israeli Competition. 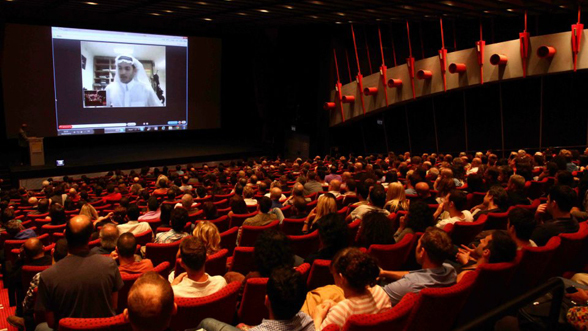 DocAviv is Tel Aviv’s largest film festival and is dedicated exclusively to documentary cinema — since 1999, it has showcased documentaries from Israel and around the world. The films are screened in the newly remodeled Tel Aviv Cinematheque, but there were also many open-air screenings in the beautiful Port of Tel Aviv. Sinai Abt, the artistic director of DocAviv, was the first broadcaster on-board with the iconic animated documentary Waltz with Bashir when he was the commissioning editor at Israel’s Channel 8. He and his team selected 12 films to compete for the Best Israeli Documentary and he also asked our jury to select the award winners for Best Debut Film, Special Jury Mention, Best Cinematography, Best Editing, and Best Research Award.